I have come to the conclusion that we are not having Summer in 2010. Today the high in Manhattan Beach was 69 degrees F and I am still wearing my winter clothes to work. You know that phenomenon where when Halloween happens, a couple of days later it’s Thanksgiving and a couple of days after that it is Christmas? Well, on Friday when I was driving home from work I saw the first Halloween costume store pop up in an empty store front. And I received my catalog for my cookbook book club and there was one whole page titled “Beautiful Holiday Recipes.” Maybe I should get going on my New Year’s Eve recipes, because it’s right around the corner. But nooo, I’m back here grilling a whole fish, pretending its summer. I got my whole Red Snapper at the 99 Ranch Market, which has about 25 feet of whole fresh fish on ice. The fish guy cleaned out and scaled my fish so it was ready to cook. The truth is, this is the first whole fish I have ever grilled and I was quite excited to give it a try. I wasn’t sure if I should put the fish directly on the grill or in a grill basket, so I started out putting it on the grill, which I had sprayed with oil. I left it on for five minutes to cook the skin, but when I tried to turn it with a spatula, the skin had stuck to the grill in places and came off. So after I got it loose, I put it in a sprayed grill basket and continued on from there. I cooked it covered and turned it several times, basting with the marinade each time, until it was no longer opaque. I brushed the marinade over the whole fish on the serving platter to give it a beautiful shiny presentation. I picked Red Snapper because every recipe I read on grilling whole fish listed it as one of the best tasting choices. And because I’m me, I had to do some research to find out all about this fish. So. The Red Snapper is found in the Gulf of Mexico and the southeast Atlantic coast of the U.S. They have been caught at over 40 pounds, but the usual range is up to 10 pounds and 20 inches in length. They are sexually mature at 2-5 years and can live for more than 50 years. Their vibrant red color comes from the high levels of carotenoid pigments, mostly astaxanthin, coming from shrimp in their natural diet. The Ginger Sweet Chili Sauce for dipping was inspired by a dish I had at a Thai restaurant a couple of years ago and has been percolating at the back of my mind ever since. As I recall, my husband had ordered a whole deep fried fish, and when he’d had his fill, I tried a bite or two and ended up finishing the whole thing, because the ginger sauce was so amazing. So I hope you enjoy my rendition, because we certainly did! 1. Warm your grill or start your coals. 2. Mix the Dipping Sauce ingredients together in a small bowl and set aside. 3. Mix the Marinade ingredients together in a medium bowl and set aside. 4. Place the fish on a foil covered sheet pan. Score 3 diagonal cuts 1 ½ inches apart along the length of fish from head to tail on both sides. 5. 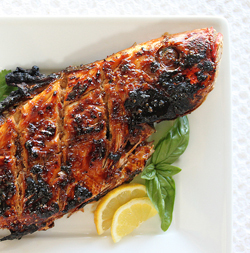 Drizzle 3 tablespoons or more of marinade over fish, covering both sides, in cuts and in underside cavity. 6. Place fish in a grill basket and grill for 20 minutes with the cover of grill closed, turning when each side is a little charred. 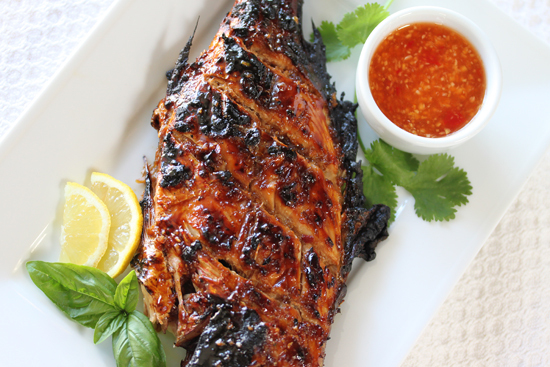 Brush with marinade at each turning and continue to barbeque until fish will flake. 7. Place on serving platter and brush with marinade for a glossy finish. Remove fish fillets to plates, squeeze lemon or lime juice over, and sprinkle with chopped basil and cilantro. Serve with Dipping Sauce in small bowls. My husband would so enjoy this one. I’m not sure that I’ve ever seen or eaten red snapper. I tried to find the pictures on web, but still don’t know. By color similar with our trilja, but much bigger. Anyway, it seems really good recipe, so I can use it with some other fish, and the most of all, pictures are more than great. I think it is so funny that you are wearing winter clothes in 70 degrees weather. you should come to NYC. It is SWELTERING here! 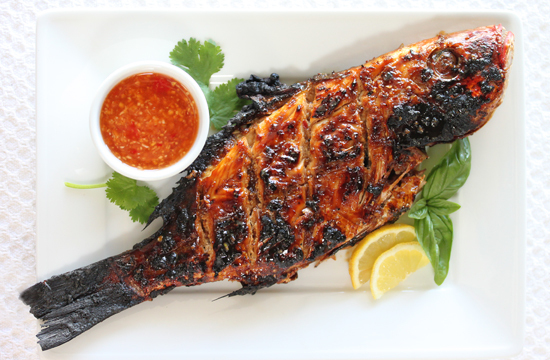 This grilled fish looks delicious. I love that ginger chili sauce. Thai sauces are my favorites. I could drink this. Or bathe in it. Or both. 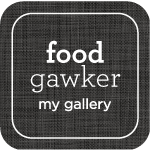 The sauce sounds fantastic…and how pretty does that fish look on your plate! Just stunning. I’m sorry it hasn’t been warm (you can take some of this Texas heat if you would like!) But it sounds like you are still finding ways to celebrate the summer! OMG… This looks amazing… looking for fresh red snapper in Virginia. On the other hand summer is so overrated. After a week or so you will have enough. It seems like East Coast is getting enough heat for everyone so come visit and ditch those sweaters. How beautiful! The one and only time I tried grilling whole fish we ended up getting take out sushi. That should tell you how well it went. I’m pretty sure I just didn’t cook it long enough, but I couldn’t even tell you what fish it was that I got. I’m glad to hear I’m not the only one who hasn’t put her winter clothes away. ARGH! Wow! Your fish is so nicely grilled! Loving all the charred bits. Yum! This looks amazing! Presentation, photos, and colors all pop. If I were allowed a grill in my NYC apartment, I’d definitely be making this. Not only can you really snap a snapper, you’re a gill master too! The whole fish so reminded me of the Wolf range advertisement when the cook moves fearlessly ahead with the whole fish despite the doubting voices in her head… That would be me… Ur dish turned out beautifully! Congrats! Brings me one step closer to cooking a whole fish, I must say! Lynne, great job grilling your snapper. I have yet to grill a whole fish but it is high on my to do list. Snapper is a great choice and your sauce sounds wonderful, I will go with your suggestion to use the basket. Girl, you can have MY summer! It’s been in the 90s for weeks! VERY hot for the mountains! Your fish leaves me speechless! A complete masterpiece! You had me at ginger and lime. Add the whole fish, and you have my heart forever. Lovely! I’m sorry, however, to hear about summer. If it makes you feel better, I feel cheated too! 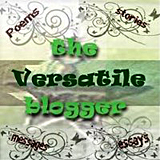 Looking forward to seeing you at the next LA Blogger get together!!! Does this still have the bones in it? Hi Augusta ~ Yes, the bones are still inside. The meat just slides off with a little pressure from fork or serving spoon. This fish does not have pin bones, so you don’t have to worry. I hope you try it. It’s so good.